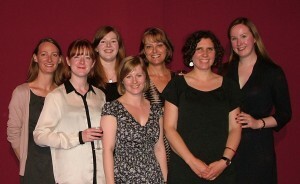 DiscoverKelpies > Awards > The Kelpies Prize > The Kelpies Prize Winner 2012! 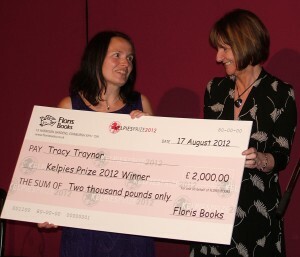 After weeks and weeks of nail-biting anticipation, here’s the moment we have all been waiting for: I am delighted to announce that the winner of the Kelpies Prize 2012 is … drum roll, please … Tracy Traynor, with Nicking Time! 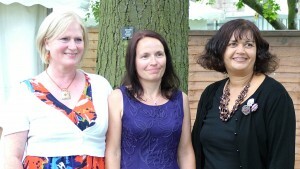 The three shortlisted authors: Debbie Richardson, Tracy Traynor and Rebecca Smith. Last Friday the three shortlisted authors, with their friends and family, attended the Kelpies Prize 2012 award ceremony at Edinburgh International Book Festival. Janis Mackay, author of the Magnus Fin series, entertained with readings from the three shortlisted books: Nicking Time by Tracy Traynor, Pick ‘n’ Mix Mums by Debbie Richardson and Shadow Eyes by Rebecca Smith. 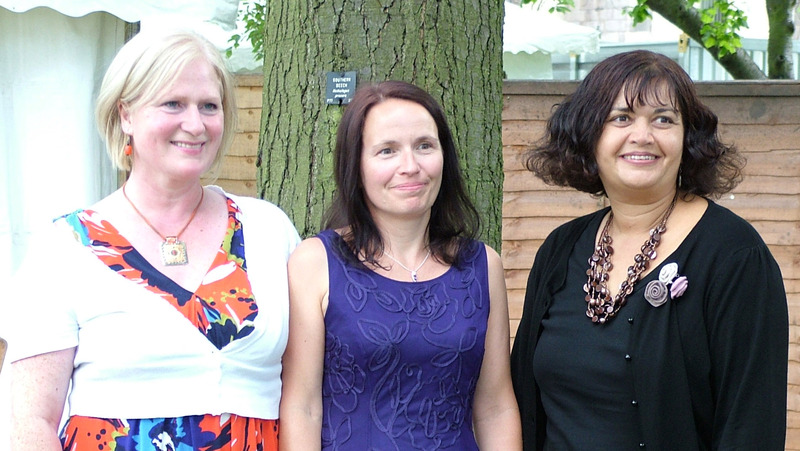 All three books were full of exciting storylines and great dialogue, and there was no knowing who would walk away with the prize! 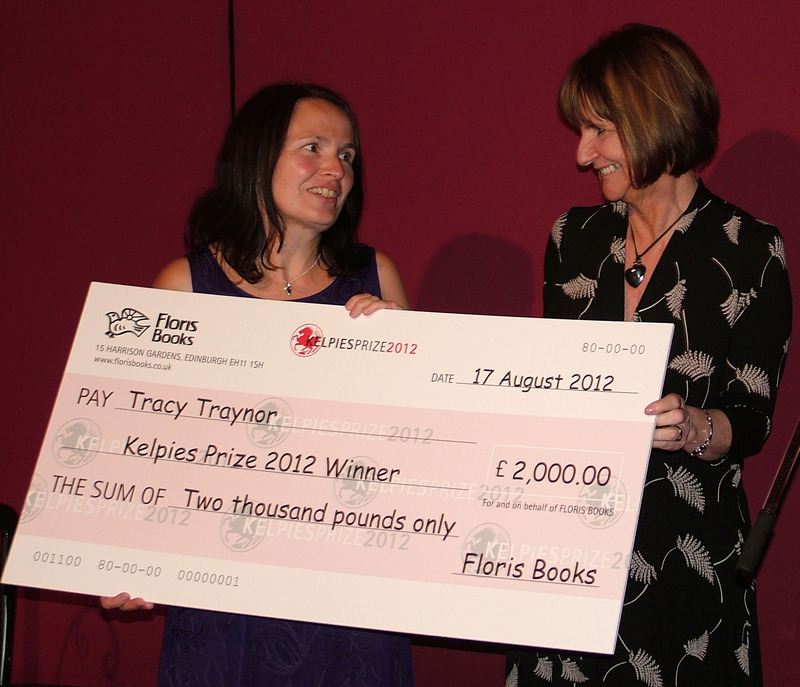 Theresa Breslin, author of Whispers in the Graveyard, Divided City and An Illustrated Treasury of Scottish Folk and Fairy Tales, made a speech about the importance of competitions like the Kelpies Prize and how great it is to find Scottish children’s books that are not just about kilts, heather and bagpipes. 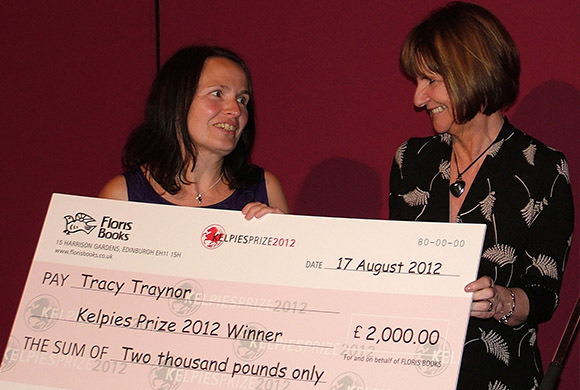 Tracy was over the moon about winning, and all her friends and family were cheering and jumping up and down with excitement. The giant cheque made everyone’s eyes pop (imagine going to the bank with that). We are really looking forward to getting Tracy’s book into the shops next spring, so we better get started.